It’s Ramadan, and no matter how vigorously you swear off fried food before it starts, you end up in a downward spiral towards all the deep fried foods that have become associated with fasting, because who needs all the health benefits, right? 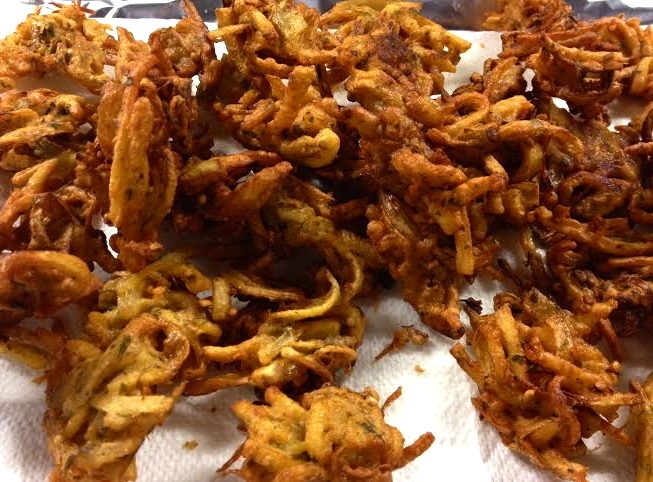 And the king of fried food are delicious crunchy and fulfilling Pakorey. I refuse to call them potato fritters or onion fritters, or fritters of any sort. They are Pakorey, and that’s what they shall be called. Pakorey are so versatile and accommodating, at least as accommodating as food can be. If you have Gram flour you’re good to go. You can add anything in the fridge, quite literally, and their making isn’t dependent on an exact list of ingredients. Here’s a list of things I add, and you’ll love this combination. If you’re making these for a large group I suggest doubling the recipe. These go fast. You literally just mix everything together. What I do is chop and mix everything up at least an hour before I want to fry them.That way, any water that the onions and potatoes release help form the gram flour into a paste. And it will seem like there isn’t enough gram flour, but you need just enough to lightly coat all the veggies. The less gram flour you add, the crispier the Pakora, and less heavy might I add. Another thing you can do is mix in 1/4 cup cornstarch right before frying. That just makes them a little more crispy. To fry, heat the oil in a pan on a medium flame, at least 2 inches deep. Mix everything up to make sure the gram flour paste is evenly distributed. Drop in tablespoons full of the mixture into the hot oil. Don’t flip them over until they rise to the top or you’ll just break them into tiny pieces and your oil will be fullof burnt specks of batter. Fry them till they’re golden brown, like shown in the picture above. And no matter how much of a hurry you’re in , don’t fry these on a high flame. That’ll just cook the batter on top and leave the center raw, and the potatoes won’t cook through either. Serve with ketchup if you must, but a mint and yogurt chutney is truly the way to go. Was almost waiting for the perfect pakora recipe and this is what it seems like. Will be surely trying this tomorrow for iftar. ThankYOU Fatima.